As I said!..Neil Campbell was an integral member of the Vibracarhedral Orchestra!.Weren't you listening?...no(? ), because you were reading......well....probably NOT as it happens.Haven't you got anything better to do? In fact haven't,... I(? )....,got anything better to do? 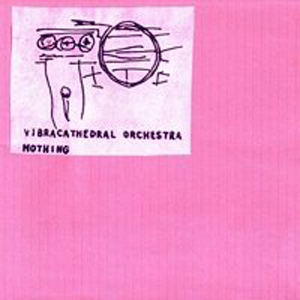 Well, to make me feel like life's worthwhile i'll tap away on my grubby keyboard on the subject of the Vibracathedral Orchestra, and generally talk about anything but the music, as I normally do. I fact I'm listening to something else while I write these words.Words that are destined to disappear forever as soon as Google decide, one day in the near future, to delete everything on Blogger without prior notice.Google plus is going in april.The only thing people are interested in these silly old days are pictures of themselves on Instagram,reading fake stuff on Farcebook,watching funny cats on YouTube,or typing about complex issues in bad english with a minimum of 140 characters....nothing shitter than Twitter, i mean, Trump uses it for starters. What am I listening to while i'm typing is garbled nonsense is what you all wanna know now right?....Ok,Ok,its that album by the late Mick Karn and Peter Murphy, Dalis Car, "The Waking Hour"....i think its well weird me;but is it weirder than Vibracathedral?.....I reckon it is. In 1998 everyone and his granny were doing a Drone project.Everyone thought you couldn't get any weirder than that. Well, now i'm of the opinion that A Flock Of Seagulls and Japan were far weirder, we just didn't realise it at the time because this stuff was in the charts. Even the members of these mutant bands thought they were making normal chart music.However, I don't think Dalis Car actually got in the charts?...did it? My sister actually turned up at a wedding looking for all intents and purposes like Mick Karn in a Dalis Car Video.I had to ask her if she wasn't actually the great Mick himself? She didn't find this funny.I was rather disappointed in fact that it wasn't the Karn himself. Twenty years in the future...yep, as a commerical for Boeing said on TV this morning, 'The Future is already here'.....and Vibracatherdral doesn't sound so much of the time(1998) as Dalis Car probably does of 1984.Mainly because 'The Drone' is a timeless form of meditative music that dates back at least five thousand years, so 1998 was merely a blip of trendiness, where the perps thought they were doing something new and fresh, when in fact they had gone back to the year zero of pop.So, five thousand years ago this would have been number one,and Dalis Car would still be lingering around the number 50 mark. But, Einsteins theory of Relativity has an interesting by-product called the 'Loss of Simultaniety'. So if one was travelling very fast (the speed of light) towards an event, say Vibracathedral playing a gig? And my sister, dressed as Mick Karn was, doing light speed in the opposite direction towards a television playing a re-run of Dalis Car on the Old Grey Whistle test in 1984, on Planet Niburu in the Oort Cloud of this solar system; they would have two different perspectives of which one was happening now or in the future or the past. My sister would see the Whistle test as having already happened, but oneself, travelling towards the Vibracathedral gig would think that that Whistle test re-run was in the future. So simutaneously, both parties would have different ideas of which was in the future,but they would both be correct.....got it? Therefore, this suggests that the future has already happened, depending on your relative speed and position in space. A third person, sometimes how I like to refer to myself as when i'm feeling arrogant...I prefer to call it confidence,....oh yeah,i digress,...the Third person....if this Third person, stands equidistant from both events, they will appear to happen in the present, simultaneously.But the other two have quite different views as to wether they have happened, or will be happening in the future.Therfore one viewer will be seeing the future before it has happened for the other. Now that I've done your Brane in, you probably need some nineties Drone music to soothe your cerebral cortex......or even better,play some Dalis Car. CLICK HERE because you have probably DOWNLOADed this already tomorrow?